We give Karma 3.5 STARS and DO NOT RECOMMEND it. We heard about Karma e-cigarettes through word of mouth and checked out their website in order to see if this new brand had anything interesting or new to present. We immediately noticed that they only offered one starter kit. It comes with either a gold or white e-cigarette. The gold unit has a black case for charging and storage. The white one has a white case. We chose the white e-cigarette and picked Tobacco High as our cartridge flavor. Either configuration sells for $59.95. The kit arrived in the mail a little less than a week after we ordered it. It consisted of a square black box containing the white charging storage case. The case is made from durable plastic and displays how much battery life remains so that you can better judge when to recharge your device. Opening the charging storage case we found two cigarette-style batteries. Each was 2.625 inches in length. There were also five openings for cartridge atomizers. Cases like this are very useful because they allow you to carry sufficient supplies for daily smoking in your pocket. You do not have to bring a USB charger or the AC wall adapter because the charging storage case holds two batteries and can charge one while you use the other. 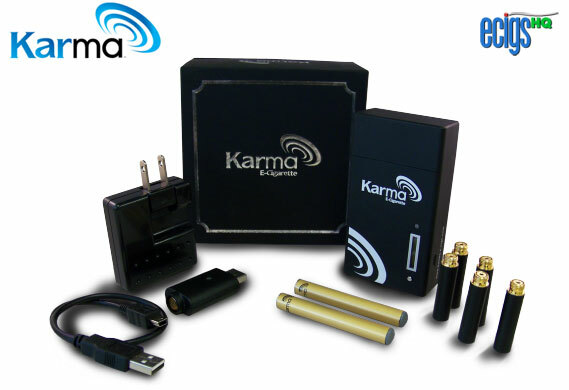 Since other brands usually sell these cases for about $25.00, we salute Karma for including one in their starter kit. To test the battery that arrived in the charging slot, we placed it in the charging storage case. The battery meter indicated that it was indeed charged because the light glowed green. After this satisfactory discovery, we unpacked one of the Tobacco High cartridge atomizers and attached it to this battery. The first drag was disappointing. It required too much effort. Our unsatisfactory experience was compounded when we exhaled. The amount of vapor was inadequate. Furthermore, there was no throat hit at all. It had a familiar flavor but it was not very good. The best thing that we could say about it was that there was not much of that flavor or any other. We did not want to let a bad first experience get in the way of our enjoyment, so we took multiple drags. Each ended in disappointment. We gave Karma every available opportunity to prove its worth. We tested the other battery with the charging case and found that the light glowed red. The battery required charging. Then we connected the USB cable to our computer and left the battery charging inside the case. We attached the functioning battery to the USB charger and plugged that into the wall adapter. We left that connected to an AC outlet in order to have it charge overnight. The next day we took out the batteries and attached fresh cartridge atomizers to each. At the very least, we can say that these components are well-constructed and durable. They fit together snugly. However, this appearance of quality was not reinforced by the e-cigarette’s performance. Each drag was difficult, the taste was unpleasant, and the vapor volume was unsatisfactory. We were disappointed in the realization that Karma would not make the top three or even the top five in our listing of the best e-cigarettes. Despite its poor performance, there was so much to like about the brand. Karma is reasonably priced, but our final impression is that while it appears to be a quality product, it performs poorly in comparison to similarly priced e-cigarettes. Despite it’s relatively low cost and well-equipped kit, we cannot recommend Karma. The cost of maintaining a pack-a-day habit with the Karma e-cigarette, including the purchase of a starter kit, came out to an annual investment of $1,171.30. This works out to a daily cost of $3.21. The cost of a single-pack-per-day habit with regular cigarettes is about $6/day. That adds up to an annual cost of $2,190. Thus Karma can save you a little more than $1,000 over the course of a year. Click on the Karma Website link below. 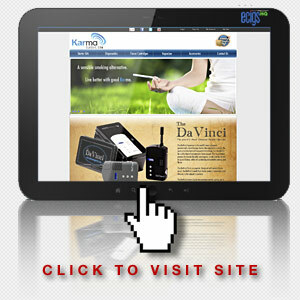 Enter Karma10 in the box for the Coupon Code at the checkout page to receive a 10% discount on your purchase.